For other uses, see Tyrone Power (disambiguation). "William Grattan" redirects here. For the New York politician, see William J. Grattan. 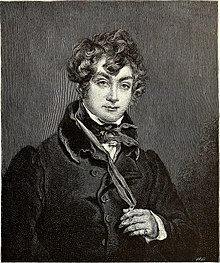 William Grattan Tyrone Power (20 November 1797 – 17 March 1841), known professionally as Tyrone Power, was an Irish stage actor, comedian, author and theatrical manager. He was an ancestor of actor Tyrone Power and is also referred to as Tyrone Power I. Born in Kilmacthomas, County Waterford, Ireland, to a landed family, the son of Maria Maxwell and Tyrone Power, he took to the stage, achieving prominence throughout the world as an actor and manager. He was well known for acting in such Irish-themed plays as Catherine Gore's King O'Neil (1835), his own St. Patrick's Eve (1837), Samuel Lover's Rory O'More (1837) and The White Horse of the Peppers (1838), Anna Maria Hall's The Groves of Blarney (1838), Eugene Macarthy's Charles O'Malley (1838) (see Charles Lever), and Bayle Bernard's His Last Legs (1839) and The Irish Attorney (1840). In his discussion of these works, Richard Allen Cave has argued that Power, both in his acting as well as his choice of plays, sought to rehabilitate the Irishman from the derogatory associations with "stage Irishmen" ("Staging the Irishman" in Acts of Supremacy ). He had a number of notable descendants by his wife Anne, daughter of John Gilbert of the Isle of Wight: Anne Power is buried in the churchyard of St Mary The Virgin Church in High Halden, Kent, England. Sir William James Murray Tyrone Power 1819–1911 Commissary General in Chief of the British Army and briefly Agent-General for New Zealand. Sir Tyrone Guthrie British theatrical director (1900–1971). Maurice Henry Anthony O'Reilly Power 1821–1849 initially trained as a barrister but later took up acting. Frederick Augustus Dobbyn Nugent Power 1823–1896 civil engineer who left a large estate of £197,000 (a minimum of 15.6 million pounds sterling or 28 million US dollars in 2006 terms). Harold Littledale Power (1833–1901) actor, wine merchant, mine agent & engineer. Tyrone Power, Sr. (1869–1931) English theatre and silent movie star. Tyrone Power (1914–1958) American Hollywood star of the 1930s–1950s. Romina Power b. 1951 American-Italian singer and film actress. Taryn Power b. 1953 film actress. Tyrone Power, Jr. b. 1959 American film actor. Tyrone Power was lost at sea in March 1841, when the SS President disappeared without trace in the North Atlantic. Born to Good Luck: or the Irishman's Fortune. A farce in two acts. Adapted from "False and True". ^ Smith, Geddeth (2008). Walter Hampden: Dean of the American Theatre. Madison [N.J.]: Fairleigh Dickinson University Press. p. 75. ISBN 978-0838641668. Retrieved 19 June 2016. ^ Belafonte, Dennis; Marill, Alvin H. (1979). The Films of Tyrone Power. Secaucus [N.J.]: Citadel Press. p. 9. ISBN 978-0806504773. Retrieved 19 June 2016. ^ a b c d e Registers of St Andrew, Holborn. ^ Northern Mariner Volume 15 (2005) p. 65 (Canadian Nauatical Research Society). Wikimedia Commons has media related to Tyrone Power (Irish actor). This page was last edited on 20 October 2018, at 15:35 (UTC).